The final Carpentier autobiography is more historiography than history: it analyzes the story of the story as much as it tells the story itself. Interviewer/ghost-writer Jacques Marchand asks Carpentier questions, not only about the events of his life but also about the ways in which those events have been recounted over the years. More specifically, Mes 80 Rounds consists essentially of a reading, by Carpentier, of Mon Match avec la vie (1954); it follows the same structure, recounts many of the same details in the same order and even re-uses many of the same quotations and descriptions found in the earlier memoir (lengthy contemporary accounts of Carpentier’s ring performances, for example). In his preface, Marchand states explicitly that both he and Carpentier referred often to the 1954 memoir in the course of the preparation of Mes 80 Rounds and explains at least some of their work together consisted of his reading passages from the earlier book and asking Carpentier questions about them. This unusual meta-autobiographical method is a particularly apt choice in the case of Carpentier, given that the various accounts of the events of his career took on a life of their own, making a distinction between man and myth nearly impossible. We had established a protocol. I would place before him his legend, so that he could correct the mistakes. We tried, together, to create an honest text, of modest historical value, by verifying the authenticity of the facts. We attempted, by taking great care with language and ways of saying things, to translate deeply-felt sentiments or truths, without stylistic flourishes and without literary pretension. The life of Carpentier was often romanticized by movies and soap operas for shop girls. That was the fashion at the time. The arc created by the various Carpentier autobiographies clearly, though not necessarily in an entirely linear fashion, moves from fiction toward fact and from myth-making toward analysis of myth-making. In June 1921, at the very height of Carpentier’s fame, an advertisement for his just-published autobiography Ma Vie de boxeur, described the work as a “fairy-tale” (a term Carpentier himself uses in the book itself to describe his life), as “captivating” and “capable of inspiring passion.” Another ad calls it, paradoxically but not inaccurately, a “veritable real-life novel.”2 Fifty-five years later, it was no longer the time for a “real-life novel” but rather for a critique of that genre; no longer the time for blurring of the lines between fact and fiction, which had characterized virtually all of the writing about Carpentier over the previous six-and-a-half decades, but a separation of the two through an examination of that very process of blurring. 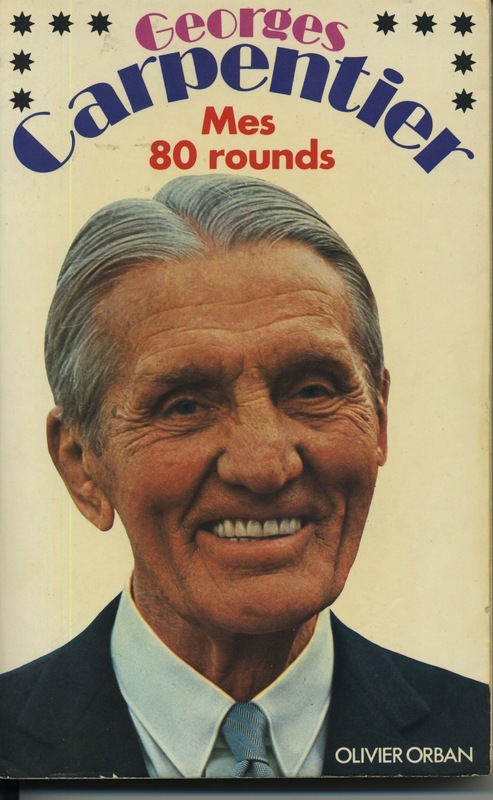 1 Jacques Marchand, Preface to Georges Carpentier, Mes 80 Rounds (Paris: Olivier Orban, 1976), 9. Return to text. 2 The ads cited here appeared in L’Echo des sports, on 23 June 1921 (“fairy-tale”) and 27 June 1921 (“real-life novel”). Return to text.